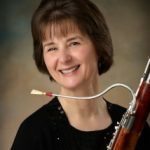 Janet Polk is principal bassoonist with Portland (ME) Symphony and Vermont Symphony. As a soloist, she has performed with the orchestras of Portland, Vermont, Indian Hill, Dartmouth College and the University of New Hampshire and with the Furman University Concert Band. Chamber music is a vital part of her musical life and with the trio, Sospiri, has recorded a CD entitled Trios of the 20th and 21st Century. In addition to her performing career, Janet is on the faculties of Dartmouth College and the University of New Hampshire.